built in 2011 higly upgraded guest house. Wake up to the sounds and views of the ocean. 180-degree ocean view from kitchen, living /dinning room and bedroom, granite counters in kitchen and bathroom, whirlpool bathtub, fireplace in living area. Fully equipped with pots and pans, dishes towels, shampoo and Neutrogena baTH GET linens, beach towels etc.. Guest house with own parking and private entrance. Dine in your private deck overlooking the ocean and zuma beach. Close to supermarket, Starbucks and more. Price includes welcome starter basket. check in time 2:00 PM checkout 10:00 AM unless otherwise specified. View Zuma Beach from the unit. watch the waves from the deck, living room, kitchen and bedroom, hear the ocean. seats four, with deck and ocean view, seating for four on deck. whilpool tub in bathroom , granite counters throughout, fireplace in living room, central air and heat, flat 47' screen TV in living room and blue ray , TV with DVD in bedroom, queen bed and queen cabinet bed in living room.dinning area seats four, wireless Internet service, pool and spa. Microwave, refrigerator washer and dryer in unit, cofee maker, expresso maker, blender, barbecue in private deck . Olivia’s place is more beautiful than I could have imagined. Great location and we were so comfortable there! Beautiful ocean views .. would recommend this highly!! The views are stunning, the area is quiet and the stay is amazing. Just the vacation we needed! Cannot wait to come back!! Beautiful view of Pacific Ocean! 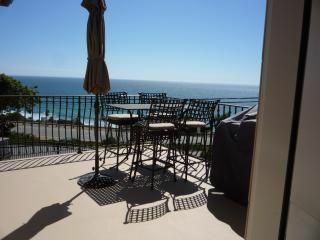 The property was perfect with a beautiful view of the Pacific Ocean. Super close to Zuma beach and hiking. We weren’t able to use the pool which was a little bit of a bummer but everything else was great. Plenty of room for our family of 4. Unit has spectacular view and everything you need! Olivia is an amazing host! Nightly Rate: $150 - $300 Weekly Rate: $1050.00-$1700.00 Monthly Rate: $5000 - $8000 25% discount Winter special Dec. 1st-2011 to February 29, 2012 on three-night stays. $300 May 16 -September 30 $200 October 1st-May 15 $150 cleaning fee THREE NIGHT MINIMUM Winter special 25% discount December 1st-2011 to February 29, 2012 on three-night stays.